"Ronni Burns practices what she preaches and makes it seem simple for the rest of us to learn." "Wow. A vision with a vision. We now ask, "What would Ronni say about that?" "You need to have Ronni Burns on your team. She is the insurance policy that your message will be heard." "To watch Ronni really listen to our people and respond in a unique way that helps them incorporate her insights is an education in itself." "Ronni was a keynote speaker at the American Academy of Orthopedic Surgeons Board retreat, speaking about the importance of communications. She is a great speaker, who is insightful, humorous and entertaining. Many of the points she shared with our Board are still referenced. She gave us valuable perspectives that have had a great influence on our approach." "I first began working with Ronni several years ago as I started my own business in China. Her guidance and insight were invaluable. She enabled me to align my company's strategy with my personal values and goals. The result was an unprecedented and sorely-needed balance between my professional and personal lives. Ronni's fresh and edgy approach, coupled with her holistic view on career and life were the keys I needed to a more fulfilling and rewarding career." "Ronni has an uncanny ability to simplify the complexity of interpersonal, inter-group and intra-organizational communication. She is genuine, unique, a natural fit to all concerned with the vital task of improving themselves and their organization. Simply stated, Ronni Burns gets it. She is a valuable and highly regarded contributor to our Executive Education programs." "This course with Ronni helped me feel better about the money I am paying for my M.B.A. The skills have already added value and made me more successful in my career." "The courses you teach are always rated in the top percent of our faculty and highly regarded by our students. I want to personally thank you for your commitment to executive education. Your infectious enthusiasm, ever-present optimism and consistent professionalism contribute significantly to the success of our programs." "Thank you for reminding me to talk in the language of benefits and to tailor my message. I love your humor and great stories that make the teaching points real and the classes a lot of fun. I highly recommend everyone takes this class, maybe more than once." "Ronni Burns is a high-energy coach who will help you cut through the clutter of your thinking. She expertly blends a results-oriented approach with an edgy sense of humor and a caring hand. What I admire most about Ronni is her tremendous insight. Her bursts of insight have been instrumental in helping me see problems in my life very differently. When you hire Ronni, you're getting a coach who'll be your strategic partner as well as your cheering section." "I just wanted to say thanks again for being willing to say what you saw for me. I truly meant it when I said it was extremely powerful. You've helped me step into such a different perspective of how I can be with what I have and haven't done in my life. You were dead on with what you've said and you've given me a key to a room I didn't know existed. What a powerful gift! I continue to be amazed by how profoundly my life is affected by our coaching sessions. Thank you for being you, Ronni!" "For so many years I've been doing what was prescribed (college, Wall Street, Business school), and while they were good experiences, some of the real dreams have escaped from the locked (or drowned out) basement. Asking myself the questions you suggested has helped me to distinguish which was a prescription and which was a dream. So thank youï¿½for putting me on the right path and sharing the journey with me." "Ronni: I wanted to let you know that I just accepted the offer and ended up receiving several job offers. I really appreciate your help in getting me to consciously smile, be conversational and be "all in" for every job interview. It really made a difference in my confidence and positively changed the energy in those meetings, which ultimately led to multiple job offers. "You immediately figured out the situation in my work environment and redirected the discussion beyond the presentation feedback session. That was a very helpful and a productive use of our time because the problem has long been on my mind. You advised me about strategies to use in both presentations and office communications which were very creative and insightful and I intend to use them from now on"
"Ronni has developed successful relationship-based sales strategies worldwide that address the emotional as well as the intellectual component of the sales process. Whether one-on-one or in front of a group, she has had significant impact on the success of our business." "Thank you for your thoughtful analysis of my presentation style. I used the tips and suggestions around involving the audience more and already feel more comfortable and confident." "The forms you gave me for analysis were really great and can be used to review content/delivery in advance of future presentations. I've taken other courses before and you offered so many great suggestions that were SPECIFIC to my presentation, as opposed to general suggestions for making presentations. This was extremely valuable. You also really motivated me to do better by starting off with a compliment. (You had me at Hello)"
"I loved the fact that you deeply listened to me during our discussion and connected it with what you saw to give me an assessment of myself rather than just focusing on the mechanics of my presentation. I will incorporate the tips given and I will practice my presentation as a conversation rather than a presentation. I will practice my transition to the wrap up using the tips given and I will return to my "style" of presentations at work while still accommodating the template police." ""Your ideas on knowing who the audience is and tailoring each presentation had not occurred to me and I see the great value and results from doing this." "This was an amazing opportunity. Getting candid and objective feedback from a professional with extensive industry experience is something I don't get in a work setting. This was an excellent opportunity to compare self-evaluation with an external evaluation. You have me totally committed to make my presentations more conversational and your thoughts about how to handle Q&A were just what I needed." "I made a lot of headway with my customer based on the presentation that we critiqued together (the Army presentation about Knowledge Management). Your feedback helped tremendously." "I had the opportunity today to brief senior leadership of the agency, trying to get approval and funding to run a pilot project to develop a new capability for my team. I already had my briefing prepared last week, but I still tried to implement several of Ronni's suggestions: I reworked my introduction to make it more personal to the audience, and I practiced it until I knew it cold; I made a conscious effort to bring a little extra energy and passion. I tried to portray my vulnerability by admitting "I'm not doing my job as well as it should be done - because I need this new capability." And I tried to do the eye-brain thing she taught, trying to find the friendly faces around the table and holding eye contact for a few seconds. Overall, it was far, far from perfect -- but it was certainly better than it would have been last week. And I got the approval and funding." "Ronni Burns captivated the audience with a combination of insight, creativity and humor and her keynote presentation was delivered with intelligence, compassion and a spirited sense of fun." "When Ronni weaves her magic people are transformed and results follow." "Polished common sense that we can all use more of." 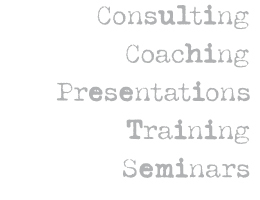 "The seminar you deliver is our most widely attended and we are still getting compliments about your performance. You do a great job simplifying complicated concepts and explaining them in a meaningful way." "I call Ronni my customer service guru. We average a lot of new customers each month (thankfully) but we weren't retaining them or cross-selling them to the extent we are now. Ronni focused us on the customer experience and has improved our communication which has tremendous impact on revenues." "We are still in awe about how awesome your leadership seminar was. Thank you. Thank you. Thank you. (things in 3's)"
The insight you provided was incredible around key factors that will be relevant as new leadership. It will be crucial to communicate clearly as we describe the challenges we expect to face. I feel confident now I can do this with both my employees as well as to the Board." "This workshop gave us not only some new ideas and tools but also the motivation to look at our options in new ways. Loved your stories and examples". "Our team has started to engage with each other very differently. I think we hit the mark and the results will show on our next survey." In her book Communication Essentials A Sell-abration, Ronni says, "if you want to change the results you've been getting in your relationships at work and at home, change your approach. KYA means know your audience. Tailor your message to the person or people you want to persuade or influence." "This book leads you on a journey of self-discovery and introduces you to the styles, tools, and techniques that can help you get more of what you want out of any conversation. Learn how to communicate more effectively, trust, nurture and use your intuition, and predict how people will behave and react." "Ronni's wisdom will connect with your head, touch your heart and tickle your funny bone." "Ronni has limited her observations of life to writing songs and ditties for friends, family and coworkers, as she no longer chooses to stay up until midnight to deliver jokes to people who have had too much to drink. She does however, find humor in everyday life and does not hesitate to try and make us laugh at any given time."